Go to the Pinterest website at http://www.pinterest.com, fill in your email address and password, then click Sign up. Next, fill in your information like your name, age, gender, and hit Let’s join us. You can also sign up for Pinterest with your Facebook account by click on Continue with Facebook. 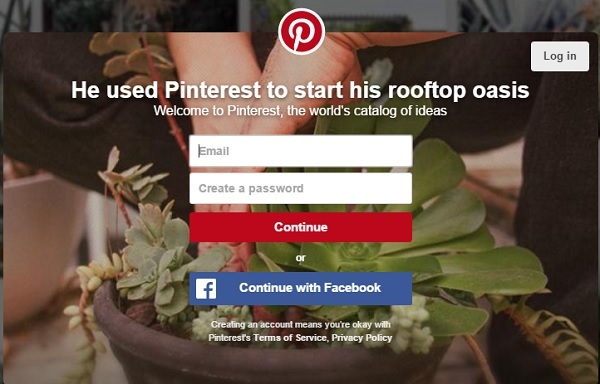 Then a popup box appears requesting you to allowing Pinterest to access to the information: Profile, friends list, email address, your birthday, personal description and your likes. Click Agree to continue. Your Pinterest account has been created and Pinterest will ask you some of the items that interest you. You need to choose at least 5 items and click the Subscribe button at the bottom of the right corner. Pinterest will also ask you if you want to create a shortcut of Pinterest website to your browser or not. If you use Pinterest regularly, select Install now, otherwise select Ignore. Finally, you also need to check the inbox of the email address that you’ve used when signing up for Pinterest account, click on the link there to enable your account. If you have already owned an account on Pinterest, but for some reason ou do not want to continue using this social network, you can apply these following instructions to disable your account. It is easy to stop using Pinterest account, however, you will not be able to completely delete your account. Instead, you can simply disable the account by hiding all the information that had been posted on Pinterest and put them on hold status. Step 1: Sign in your Pinterest account by accessing to this following link: Pinterest.com, fill in your username and password. Step 2: In the personal page on Pinterest, click on the username at the top right corner of the screen. Select Settings. Step 3: In Settings, scroll down until you see the Deactive Account and click on it. Step 4: After disabling the account, Pinterest will ask you to confirm. You agree by clicking on the Deactivate Now button. Your whole personal page will stop working, and links from Pinterest to Facebook and Tweeter accounts will also be disabled. A small note is that you can only disable your Pinterest account by using a computer. If you use a mobile phone or tablet, this method is not applicable. After you disabled the account, Pinterest continues to reserve your username and password. If you want to use this social network again, you just need to log in as usual.